Ask locals, and they’ll tell you that over the last 25 years, the Cohens have done more than “make it work.” Together, they’ve touched the lives of thousands of students, many of whom still regard the couple as friends. More than 200 students, alumni, colleagues, friends and family members came out to show their support at a dinner held earlier this year. Sponsored by the Midlands Region Chaplaincy Board, the event honored the Cohens’ quarter-century of service. Speaking after the dinner, Esther Cohen said that from day one, they focused on finding ways to help Jewish students, many of whom were away from home for the first time, cope with the various challenges of university life. They sought to establish innovative programs and activities with the goal of building a sense of community. Mendy Cohen, one of the couple’s four sons, compared the constant bustle of his childhood home in England to Grand Central Station in New York City, where he now resides. It wasn’t uncommon for the Cohens to prepare enough food for a Shabbat dinner for 20 guests when, without warning, 40 would show up. “My mother would just make more salads and put up more tables,” said Cohen. Esther Cohen started teaching and later earned a degree in counseling. 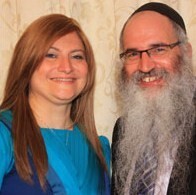 In addition to assisting Fishel Cohen with his chaplaincy duties, she also serves as head of religious education at the King David School and runs her own clinic, Kadimah Counseling Service. She said that the research she conducted as part of her course work on the psychological needs of Jewish students was invaluable. Over the years, the Cohens’ programs ran the gamut of themes. In addition to their weekly Shabbat dinners and holiday events, they continue to host open houses during exam season, inviting students to drop in between study sessions for a home-cooked meal. Among their new projects is “Esther’s Café,” a group of 50 students who gather at a local Hillel House for a regular address by an educational speaker. Holly Kilim, who attended Birmingham University from 2004 to 2009, met the Cohens during her third year of medical school. Kilim and her fiancé studied with the Cohens for several weeks before their wedding in London. Fishel Cohen officiated at the ceremony. Louise Weinberg, a Birmingham student in 1995, has fond memories of all-night cooking sessions and lively holiday meals. From their vantage point in the Midlands, the Cohens have witnessed Jewish life change in this corner of England. The Jewish student population, which was about 200 when they arrived, has grown to more than 2,000. To accommodate their growing needs, Fishel Cohen, who acts as a student advocate with administrations, fought to bring kosher food to Birmingham and Nottingham. For his part, he said that he tries to visit as many students as possible in order to reach the unaffiliated. Esther Cohen, meanwhile, is a regular in the student library during midterms, distributing packages of homemade chocolate cake with “good luck” tags attached. And they still deal with the age-old problems of homesickness and pre-exam jitters. The economy, they asserted, has only placed more pressure on students. Looking to the future, she predicted that Jewish life in the area would continue to grow.